Last Friday (30 May 2008) saw the annual Old Pulteney Prohibition Ball being held at the Pulteney Distillery in Wick. Beating last year's record intake, an astonishing �5265 were raised and donated to Wick's RNLI Station. The ball took place to commemorate the repeal of prohibition in Wick and was held for the second time, after its inauguration in 2007. In a marquee that was erected especially for the occasion in the distillery's courtyard, and fueled with entertainment by local band KW1, a fantastic after dinner performance by Tom Morton was enjoyed by a lively crowd, who contributed greatly to the chosen charity through ticket sales and a silent auction. Fine dining, dancing, superb prizes and a fantastic atmosphere ensured a great evening for the local community. A further highlight of the evening was the recognition of James McCaughey, a local boatbuilder and businessman, who was awarded with the Old Pulteney Maritime Achievement Award. Mr McCaughey has contributed throughout his life to Wick's community, economy and maritime industry as a boat builder, repairer, employer and through being heavily involved in the RNLI for over 21 years. 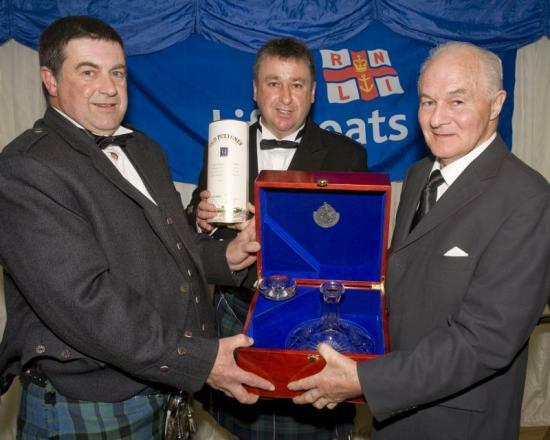 He was honoured for his lifetime achievement and was presented by Distillery Manager Malcolm Waring and the RNLI's Head of Operations Colin Richard with a specially engraved Old Pulteney crystal decanter. themselves and had a wee dram or two! I'm delighted that we were able to raise such an incredible figure for Wick's RNLI Station and I cannot wait until next year. We have already taken table bookings for 2009!" For ticket information and bookings please contact the Pulteney Distillery on 01955 602 7780. Wick became a dry town following the campaigning of American Evangelist Aimee Semple Macpherson, who during the years between the two world wars was the most flamboyant and controversial minister in the United States. A glamorous lady of celebrity status she held the USA in her grasp and as her power spread across the water 57 parishes signed up for prohibition. Wick was one of the 57 and the prohibition lasted until the law was lifted in 1947. The first Old Pulteney Prohibition Ball was held in 2007, commemorating the 60th anniversary of the repeal of prohibition in Wick. Launched by parent company, Inver House Distillers in 1997, Old Pulteney 12 year old Single Malt Whisky is enjoying rapidly increasing appreciation amongst whisky lovers, with its windswept coastal location contributing to an unusual and distinctive taste. With a faint flavour of the sea, Old Pulteney is known as the Genuine Maritime Malt or sometimes 'Manzanilla of the North', after the coastal sherry produced in Spain. Old Pulteney is a multi award winning malt, the latest being the Gold: Best in Class at this year's International Wine and Spirits Competition. Inver House also produces a range of blended malts, blends, vodka, gins and liqueurs, such as Scotland's Original Cream Liqueur, Heather Cream. Photograph: Colin Richard (Head of Operations, RNLI), Malcolm Waring (Old Pulteney Distillery Manager), James McCaughey (Old Pulteney Maritime Achievement Award Winner); Tom Morton; Old Pulteney 12 Year Old. A well rounded article about Wick and Whisky has appeared on the Scotch Whisky blog on www.scotchwhisky.com The article is a short history of the connections between whisky, fishing and the town with some period photos. See it in full at https://scotchwhisky.com/magazine/around-the-world/whisky-travel/17411/wick-whisky-and-the-herring-boom/. The extraordinary achievement was announced at Whisky Magazine's prestigious World Whiskies Awards, hosted at the Grand Connaught Rooms in London. Only the world’s most exceptional whiskies were nominated, and with a record number of entries this year leading to tough competition, we have even greater cause to celebrate this accolade! We released our peated 1989 Vintage in September 2015 as the embodiment of Pulteney Distillery’s renowned craftsmanship. 'Angel's Share' of Maritime Malt will help Seafarers in Need. Old Pulteney Single Malt Scotch Whisky has announced a new partnership to raise vital funds for the global maritime charity The Mission to Seafarers, the organisation that cares for the world's 1.5 million men and women who face danger each day while working at sea. Rural Affairs Secretary Richard Lochhead saw a little bit of history being made during a recent visit to Wick's Pulteney Distillery. A 40 year old single malt has been launched by the distillery - the oldest whisky the company has ever released. Old Pulteney Single Malt Scotch whisky is delighted to announce that its annual charity event, The Old Pulteney Prohibition Ball, raised over �4,600 for the local RNLI Station in Wick, Caithness. The ball, which took place on Friday, 27th May 2011, commemorates the repeal of Prohibition in Wick and was held for the fifth time after its inauguration in 2007. Old Pulteney Single Malt Scotch whisky is delighted to announce that its annual charity event, The Old Pulteney Prohibition Ball, raised over �5680 for the local RNLI Station in Wick, Caithness. The ball, which took place on Friday, 4th June 2010, commemorates the repeal of Prohibition in Wick and was held for the fourth time after its inauguration in 2007. Old Pulteney single malt whisky has helped a separated Cape Wrath couple celebrate their reunion this week with a bottle of their whisky from their Wick-based distillery. John and Kay Ure, who run an isolated tea room in the UK mainland's most north-westerly tip, were forced to spend the festive season apart for the first time in 35 years when the 'big freeze' hit in December. Pulteney Distillery Announces Its 2008 "Old Pulteney Prohibition Ball"
Old Pulteney Single Malt Whisky is delighted to announce details of this year's charity ball, which will take place on Friday 30 May at Pulteney Distillery in Wick - the ball, which is held to mark the anniversary of the repeal of prohibition in Wick, is the second to take place since the prestigious annual event kicked off last year. Tickets are on sale now and demand is expected to be high. Inver House Distillers and North Highland Products launched the first ever North Highland Blended Malt Scotch Whisky, Barrogill, as part of the prestigious Mey Selections range of food and drink products, at the Castle of Mey in Caithness today. Mey Selections Barrogill Blended Malt Scotch Whisky takes its name from the history and heritage of the Castle of Mey, the most northerly castle on the Scottish mainland just a few miles from John o'Groats. Old Pulteney Single Malt Whisky is delighted to once again support the famous Mey Games which will take place on 5 August at the Castle of Mey - a mere 20 miles from the distillery and Old Pulteney Visitor Centre in Wick. During the Games, Old Pulteney will be providing whisky prizes for several key events and supplying some of its delicious 21 year old single malt for guests to enjoy in the VIP tent.